Our friends at Verve/Universal Music are offering a copy of the five-CD box set Oscar Peterson Plays to a lucky JazzTimes reader. The 113-song, digitally remastered collection assembles 10 albums by the pianist during 1952-1954. 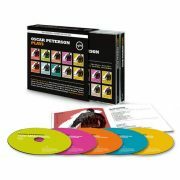 Containing many of Peterson’s most important recordings as a leader, these albums explore the canons of songwriters Harold Arlen, Irving Berlin, Duke Ellington, Jerome Kern, Jimmy McHugh, Cole Porter, Richard Rodgers, Harry Warren and Vincent Youmans, in the setting of the Oscar Peterson Trio. Enter by April 30 to be eligible to win a copy of Oscar Peterson Plays. Fill out the form below to be entered to win Oscar Peterson's box set! Yes, I would like to receive the FREE JazzTimes newsletter. Yes, I would like to receive information from our sponsors.